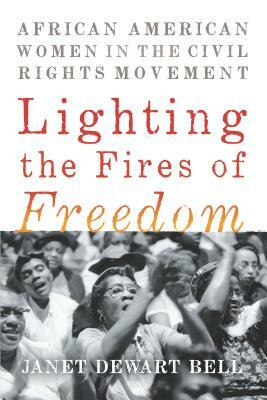 In Lighting the Fires of Freedom: African American Women in the Civil Rights Movement (The New Press, 2018), Dr. Janet Dewart Bell provides an oral history of nine women who bare their souls as they speak of their lives as activists, their challenges, the nature of movements and more importantly what it has been to be a woman in the Civil Rights Movement. The book grew out of Dr. Bell’s dissertation on female civil rights activists. Through the interviews, Bell allows us to hear the voices of women who were unsung “sheroes” of the movement. They include women such as Leah Chase who provided a safe haven for civil rights activists in Dooky Chase, her New Orleans restaurant, Diane Nash, a leader of the Nashville Sit-in Movement, Dr. June Jackson Christmas, a trail-blazing psychologist who opened her Town House to civil rights workers, Aileen Hernandez who led student protests at Howard and later became a labor activist and leader of the National Organization for Women, Judy Richardson who was active in SNCC as a young leader and associate producer and education director for the documentary Eyes on the Prize, and Kathleen Cleaver, activist and professor of law. We get a sense of their inner thoughts and in some cases, aspects of their lives that have not been shared. This is most evident in the chapter on Myrlie Evers, civil rights leader, former head of the NAACP and wife of Medgar Wiley Evers. Ms. Evers describes the personal sacrifices of her and her late husband. She recounts their fears and anxieties as they endeavored to do the work of voter registration in Jackson, Mississippi. Their home, now an historical landmark, was the site for many civil rights activists. Ms. Evers underscores that much of their strength came from the many people around them. Central to this book is the conceptual framework that Bell uses to discuss the nature of Black women’s leadership. Motivated by sacrifice and commitment, these women adapted servant leadership, adaptive leadership and transformative leadership. They eschewed top down leadership and encouraged respect, resilience and transparency. Through service leadership, they believed in serving as opposed to getting power for themselves; through adaptive leadership, they developed effective coping mechanisms, and through transformative leadership, they adapted nontraditional approaches to leadership. This book is a testament to the women who were visionaries, community organizers and activists, women who advocated, sacrificed and fought for social justice. African American civil rights activists such as Ella Baker, Fannie Lou Hamer, Constance Baker Motley, Dorothy Heights and Coretta Scott King are in our public sphere. Bell has made us aware of the courage and character of some the invisible leaders and in doing so has given us an important addition to our canon on the Civil Rights Movement. Dr. Janet Dewart Bell is a social justice activist, communication strategist and award-winning television and radio producer. She founded the Derrick Bell Lecture on Race in American Society series at the New York University School of Law. Read The New Press’s description of Lighting the Fires of Freedom: African American Women in the Civil Rights Movement.